Nineties grunge-inspired looks were a big trend for fall. Come spring, designers are focusing on the later part of the decade’s cleaner and more minimal side. 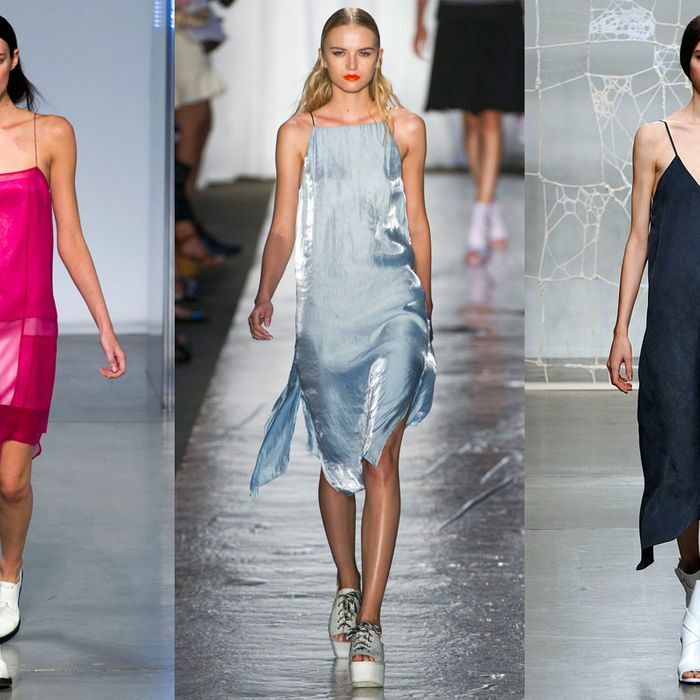 Simple slip dresses that cut away from the body popped up at several shows in an array of hues, all paired with white shoes and freshly parted hair. At Helmut Lang, a sheer, paneled fuchsia number stood out among the sea of stark black and white ensembles. Suspended by delicate straps, it appeared to almost defy gravity. Over at rag & bone, the palette consisted of pastel shades like this pale blue silky, iridescent version with slits up the thigh to enable movement. Finally, at Tess Giberson, the designer took a more somber route, showing a chic, navy dress with an asymmetrical hem that hit modestly at mid-calf.